for our 70th Anniversary in 2019! at a different venue everyday! How it all began North West Norfolk Week started from the idea of Oliver Atkins and Lionel Wilkinson, who suggested that the coastal clubs between Brancaster and King’s Lynn should pool their resources and organise a regatta that involved all the clubs in the area. 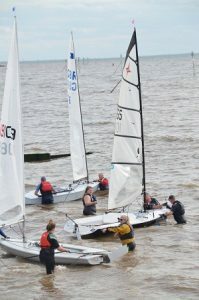 Entry Forms North West Norfolk Sailing Association 69th (2018) Annual Open Meeting for National 12, Allcomers handicap (Fast and Slow Fleets), Supernova, Laser & classes with 5 or more entries. Explore We have added some useful links to help you find out more about North West Norfolk and the surrounding area. Welcome to the North West Norfolk Sailing Association website. The 69th edition of Norfolk week has now completed with over 70 boats taking part and we are now starting to plan for the 70th! Here you will find details of past Norfolk Weeks and over time we will start to add information ready for the 70th celebrations! Next years dates are confirmed as the 27th July through to the 3rd August 2019. We have also included some links for you to help you find out more about the area. Please note we will add 2019 documents to the site as we get nearer the event. Also don't forget to click the Facebook link for additional information and to get involved as you prepare for Norfolk Week 2019!